Congratulations to our newest member of the team member Joe McShane! 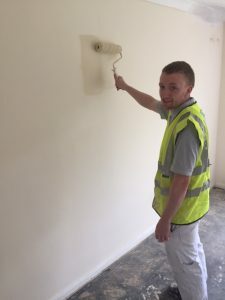 Joe joined us on a work placement via Lancashire County Council as he wanted to gain experience in painting and decorating. We were so impressed with Joe’s work ethic and commitment that we’ve offered him a permanent job just 4 weeks into his 8 week placement. Joe will now be training as a painter and decorator with one-to-one training from one of our most experienced operatives. Well done Joe and welcome to the team!